North Korea is making its demands clear. This has very little to do with military drills and more to do with the Sunday talk shows in the US during which John Bolton, President Donald Trump's national security adviser, and Mike Pompeo, the secretary of state, outlined what might be on offer if Kim Jong-un gave up his nuclear weapons. The North Koreans have been watching and they do not like what they have heard. The whole reason the state has spent years building up a nuclear arsenal, at such a great cost, is for survival. So to compare denuclearisation in North Korea with Libya - as John Bolton did on Sunday - is not going to offer much comfort. The regime collapsed and its leader did not survive. The root of the problem is one of language and interpretation. For months, the world has heard that North Korea is willing to denuclearise and many analysts in Korea raised their eyebrows. They warned that there was a gap between what the US and North Korea would mean by that. America wants North Korea to give up its weapons over a set period of time and only then will it be given economic rewards. They also want the process to be quick, perhaps over a couple of years. North Korea's definition of denuclearisation is very different. It has always talked in terms of the entire peninsula. That means the US has to act too - perhaps cutting the number of troops based in South Korea or also getting rid of the nuclear umbrella it uses to protect the region. If the state is going to give up its weapons it will also want security guarantees. Go Myong-Hyun from the Asan Institute thinks Donald Trump has "finally met his match" when it comes to geopolitical negotiations. "The US appears to have been coming up with additional and more stringent demands that North Korea didn't like. What they're saying is if you keep giving demands that we don't like, we are willing to walk way." There are, however, signs some sort of a deal can still be done. John Delury, professor of history at Yonsei University, is optimistic. He described this as a "hiccup" but believes the situation could be diffused with the right message. "North Korea didn't say it wasn't going to give up its nukes. It said we are not going to denuclearise if you're going to hold a gun to our head. They're not going to give up this deterrent for nothing. They're saying this process is going to have to be reciprocal and you're going to have to do stuff just like we do stuff." This announcement is a warning shot to the Trump administration. North Korea is obviously aware how much President Trump wants this summit, as Go Myong-Hyun points out. "He's been spending a couple of weeks taking credit for the positive outcome. North Korea has realised President Trump's political capital is invested in this. Another way of putting it is he is trapped in this process. If President Trump doesn't stop making demands and not offering anything in return then he's going to lose his summit." The "taking credit' part has also irritated Pyongyang. There were signs of it during the US secretary of state's latest visit to the North Korean capital. At one point, a senior official turned to Mike Pompeo after a warm toast and reminded him that this process had not come about due to the Trump administration's maximum pressure strategy or sanctions. North Korea wants the world to know that it is coming to the negotiating table from a position of strength. It may also feel that it is making all the concessions. It has suspended all missile tests and released the three US detainees. Kim Jong-un met President Moon and the pair signed a declaration, and they are about to dismantle a nuclear test site in front of international media. So to hear the Trump administration claiming credit for a deal it does not like has been a step too far. Many will say this move is straight out the Pyongyang playbook. That North Korea has a history of walking away from talks and deals. It does. It also has a lot more experience at this kind of diplomacy than the current US administration. The development will hand sceptics more ammunition to say that this time is not different, as so many had hoped. And that after all the smiles and handshakes and walks in the garden with President Moon, Kim Jong-un remains untrustworthy. That makes the next few steps even more difficult. South Korea and the US must decide how to respond. Do they cave in and offer a concession? Perhaps scale down the military exercises? 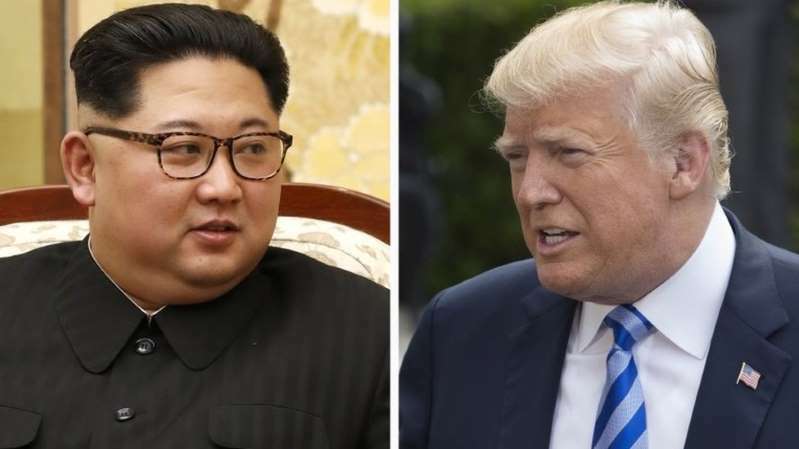 Or do they tough this one out and hope Kim Jong-un wants this historic summit with the US president just as much as the other way around?